I'm afraid that your post only reveals that you are, frankly, just not aware of what the "current" apologetic arguments are, and what evidence has been marshaled to support those conclusions. Do you realize that the most significant work on these things has only occurred since Professor Hauglid's address in 2006? Suffice it to say that Book of Abraham apologetics, rather than being (as I believe you have concluded) a "spent force," has actually advanced, albeit to a great extent "behind the scenes," from infancy to adolescence and is now, in my estimation, on the verge of strong and vibrant manhood. So if most of this significant work has happened in only the last three years, and if it has happened, to a great extent, "behind the scenes," then how the heck do you expect Charles (or the rest of us without backstage passes, for that matter) to be aware of it at all? I'm certainly sitting at the edge of my seat in anticipation of all this promised greatness to be coming forth shortly, but in the meantime, it seems sorta silly to expect people to be aware of and convinced by that which still exists, to a great extent, solely behind the scenes. I believe the fact that FAIR and the MAD Board are places where "behind the scenes" is being aired, at least in part, and the fact that Charley is privy to both is the basis for any irritation you may have inferred. There's a good bit of information been shared in a whole lot of threads hereabouts, both on this particular board and on the pundit board. Yeah, these guys are always "on the verge" of explaining everything. I find his comment about Tvedtnes a sucker shot, especially since I know the actual "behind the scenes" reason for his change of position. I've been in this business almost 20 years, and I know a cheap shot when I see one. Billy, you gotta better do better than that. Let's see what you got and no more cheap shots. Discussions about much of the scholarship has occurred right here, in one form or another; in bits and pieces. Even a good deal of summary analysis has been proffered, if not comprehensively presented. Granted, that does not constitute formal statements of positions, nor the formal presentation of evidence, nor the complete articulation of what are seen to be the logical conclusions. But you're absolutely right that when I say "behind the scenes" I don't intend to imply that the arguments have not been made in some form or another. There aren't going to be any revolutionary new theories in the end. In fact, I have made it perfectly clear that the people who will end up "vindicated" in the end are none other than Jay Todd and Hugh Nibley. I maintain that their fundamental argument concerning the relationship of the KEP to the translation of the Book of Abraham was correct, albeit, at the time, not established via solid textual criticism, historical evidence, and persuasive analysis. I'm glad to see that Brent Metcalfe has (although I have yet to read what he has written there) apparently chosen this moment to present some of his conclusions in this board's Pundit's forum. I will read what he has written with interest, although I'm fairly confident that most of what he will present there will conform to things that he, or some of his colleagues, have already argued in some fashion. I am absolutely thrilled that the debate about the relationship of the KEP to the BoA is about to really begin in earnest. I look forward to it. I remain very confident about its ultimate outcome. I believe the "meaning of the Kirtland Egyptian Papers" is becoming increasingly clear as more and more people address that question. That some people will rigidly adhere to their former ideas regardless of the persuasiveness and significance of the forthcoming scholarship is, of course, to be expected. That reality doesn't concern me much. The weight of the facts, as demonstrated by the textual evidence, will prevail in the end. I certainly intended no "cheap shot" at John Twedtnes. I don't know the man, have never met him, nor corresponded with him. I've only been told that he no longer adheres to his mnemonic device theory. I know of no hidden motive for his renunciation (if that is even what he has done) of his former theory. If, as you appear to imply, he still privately holds to that theory ... well, I therefore acknowledge that possibility, in which case I have heard incorrectly when it comes to his beliefs. I do not personally believe the mnemonic device theory has been shown to be credible, nor to have explanatory power in the context of everything else we now know about the Kirtland Egyptian Papers. You, of course, are free to believe what you will. Congratulations, Chris. I will have to track down a copy! William, are my thoughts of the KEP as practice for a lot of the scribes have any merit? You know very well it was directed at me, with your constant "are you aware" questions, with the obvious intent of making me look uninformed and foolish. (I can do that myself, with no help from you) You're out of your league when it comes to making personal attacks....... You get no respect. And with your forced confession here, I would constantly have to wonder what crucial details bozo is leaving out...... No credibility. But, hey, no big deal -- who cares what I think? You're a Pundit! That bestows honor and credibility, kinda like the Nobel Peace Prize. Other than the undertone of rather intense hostility (the origin of which eludes me) I have to say I really have no idea what you're talking about. "You're out of your league when it comes to making personal attacks ..."? Huh? I've been led to believe I'm the only one in my league. "You get no respect."? Well, that's probably true. I am, after all, the "vulgar sciolist" of LDS apologetics. "... your forced confession ..." Huh? "... details bozo is leaving out ..." Huh? "No credibility ..." Yeah, but what I lack in credibility I make up in bombastic certitude. "You're a Pundit! That bestows honor and credibility ..." Oh, yeah! And the pay is not bad, either. "... kinda like the Nobel Peace Prize." These days, if weighed against each other, you'd be hard pressed to live off the difference. I apologize to everyone here for the defensive, negative tone of my previous post. Getting back to business, for me the critical issue is **why** the BOA text is juxtaposed to the text of the Book of the Dead, and whether JS played a role in its creation. This theory has the best minds in the business trying to answer the many questions that this theory poses. Lots of bandwidth expended in trying to answer those questions. Recently Gee gave us a status report on this theory, and you can decide for yourself what he said. To answer your question, there is something you're missing here. The above theories all attempt to find a possible way to make the papyrus Joseph Smith used something that it is not, which is something to do with Abraham. It is a common Egyptian papyrus from the pagan book of the dead, it was found in a mummy that Joseph Smtih bought, it has nothing to do with Abraham, and is exactly what it should have been when joseph Smith bought the 4 mummies for $2300. 1) Before the Egyptian mummies found Joseph Smith, me incorrectly identified the Greek Psalter as Egyptian. He had completed his new doctrine and needed a vehicle to launch it, which would introduce polygamy as doctrine (he was already secretly practicing polygamy). Dr. Henry Caswall was an honest man and, after hearing that Joseph Smith could translate Egyptian (no one could at the time and it created a mania of sorts), set out to see wheteher or not he was what the word on the street was claiming. When he got there to meet with Joseph Smith, Joseph Smith played dumb and spoke as an uneducated ignorant man, but only loud enough for Caswall to hear him. Once Joseph Smith was deemed incorrect by Caswall, he told Joseph Smith what the psalter was and Joseph Smith left. Today, all one hears about this is what John Taylor remarked about Dr. Caswall, which is the most biased bunch of nonsensical character assination he could possibly toss out, calling Caswall ecil, which he clearly was not. For more, read this with a critical thought process: http://mormonthink.com/greekweb.htm . 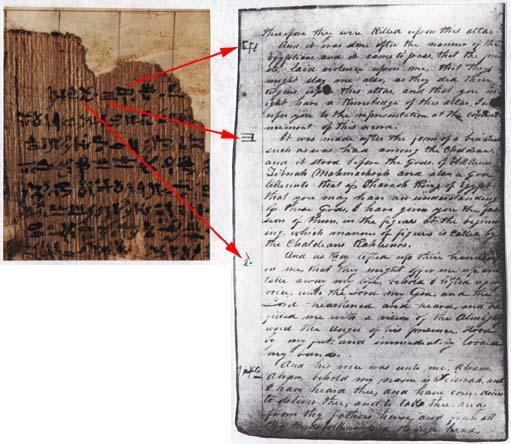 2) When word got out that Joseph Smith could translate Egyptian, the mummies found him. The were stolen out of Egypt. and weren't found in some monk's cave, but from a tomb. The mummies found him, and he bought them because he knew they were real and no one could prove his translation was wrong. The papyrus found in the mummy is exactly what it should be, and that would be spells and information the dead person would need in the afterlife per the pagan religion, which is out of the Book of the Dead. http://mormonthink.com/boaweb.htm and here: http://trialsofascension.net/mormon/abraham.html . 4) After Joseph Smith's death, Emma Smith sold the papyrus and signed receipts to prove they were in fact the ones he husband used to translate the Book of Abraham. They were lost, turned up in 1967 and given to the Mormon church. When compared to the book Joseph Smith wrote. "Egyptian Alphabet and Grammar" it clearly shows the papyrus is the one that matches his book. See picture here: http://nowscape.com/mormon/scrl-xl.jpg . Note also there was a map glued to the back of the papyrus that had a map of Kirkland on the back of it. 1) Why does the Mormon church hide the papyrus Joseph Smith used, along with the receipts written by Emma Smith that validate them as the ones he used, and his unfinished work "Egyptian Alphabet and Grammar" from its members, or for critical examination from an unbiased (non-Mormon) source? 2) Why do you suppose the papyrus survived the fire so it could be given to the church in 1967? Conclusion: The reason the Mormon church hides the papyrus and Egyptian Alphabet and Grammar, it becuase it exposes Jospeh Smith as a fraud, and proves he could not translate Egyptian. It also would prove that Mormon doctrine came from the pagan Book of the dead, and is clearly not of God in the Christian religion. Note that because his translation is incorrect, the God would be mistaken as well if he were in fact guiding Joseph Smith, which he clearly was not. Honorable mention: The Kinderhook plates were to be Joseph Smith's next vehicle to launch new doctrine. Joseph Smith claimed they spoke of Ham and started to translate them, and we now know for a fact they were a hoax. When is all this going to add up to the truth, instead of these theories based on factual documents that the Mormon church has had since 1967? If you want to know the truth, ask to see the documents. Note also that to my knowledge no Mormon "approved" website has pictures of the papyrus or Egyptian Alphabet and Grammar. If they do, please link me to them. I was first motivated to reply to cdowis's post, which contains all kinds of misconceptions and factual errors. Then I quickly read through thews's post, and saw that it contained several times more misconceptions and factual errors. So now I've decided to abandon any attempt to respond to either. When people refuse to avail themselves of the already-available information on a topic, and instead simply choose to fill their heads with nonsense and randomly-assembled bits of information, all while holding resolutely to their previously-acquired notions--no matter how inaccurate and unsupported by evidence--then what hope is there to disabuse them of those notions by an appeal to correct knowledge? I know I don't intend to try. I will only say one thing, The Letter of Recommendation Made by Isis (a more correct rendering of the so-called "Book of Breathings") is not part of the Egyptian Book of the Dead. Its apparent inclusion on a scroll containing a copy of the Book of Abraham is intriguing, and (in my estimation) opens up all kinds of interesting lines of inquiry concerning the "conventional" understanding of the purpose and use of so-called "funerary" documents in ancient Egypt. Perhaps "temple documents" would be a more accurate description of such things. Interested readers are encouraged to consult both the article linked above, as well as Nibley's The Message of the Joseph Smith Papyri. The church has never hidden the papyri and it does make them available for examination. Because the surviving fragments were never in Chicago. I hear this claim a lot... yet there's nothing quoted or backed up to actually what is supposedly an error. If you claim sonething I said or posted was an error, please be specific, because everything I said is correct. If you had some data to post to back up what you said, I think you would... so I must assume you don't. People who seek the truth should see the papyrus for what a papyrus is, and that's pagan documents from the book of the dead. Again, please be specific as to what you claim I said is wrong based on facts. You're mostly right. But Nibley obscured their whereabouts for half a decade before their "rediscovery", and the Alphabet and Grammar was long concealed even from the Church's own top scholars. As for the Mnemonic Device theory, Charles and thews are missing the most pertinent point, which is that the Egyptian Alphabet and Grammar explains in some detail how the Book of Abraham was supposedly derived from these Egyptian characters, and it is nothing like what Tvedtnes proposes. According to the EAG, the characters in the margins of the translation manuscripts are composite characters, each comprised of a half-dozen or so sub-characters. The sub-characters are each assigned one or more English meanings, and then these English meanings are to be strung together with a specified number of "connecting parts of speech". Thus the Mnemonic Device theory requires, almost as much as the Missing Papyrus theory does, that JS had no idea what he was doing with the EAG. Nibley's suppression of the papyri until he could prepare an apologetic response is known mostly from various Egyptologists' letters to Jerald and Sandra Tanner, which they have documented in their typically sordid style in various of their books, including Mormonism: Shadow or Reality. As for the Grammar, the main source is James Clark's rather obscure talk, "A Brief History of the 'Egyptian Alphabet and Grammar' and Related Documents" in the Book of Abraham Symposium volume, available at the BYU library. Not only were he and Sperry repeatedly turned away by the Church Historian when they inquired about the Grammar, but when they finally were allowed to see it in 1938, they weren't allowed to announce their findings. It took the Tanner publication to break the ice. Even Nibley admitted in his "Prolegomena" that the Alphabet and Grammar "was hidden and suppressed for the same reason that Brigham Young's laundry lists are hidden and suppressed, because it was nobody else's business." There will be no such textual evidence, because this is almost certainly not the original. The original would not have been mailed off in a letter, for one thing. And for another, the specimen was obviously still available to Joseph and co. when they created the parallel Egyptian Alphabet documents, because its content was incorporated into the "second part". However, there is good reason to consider the specimen to be Joseph Smith's production. It stands in a tradition of Smithian documents, starting with the Anthon Alphabet, continuing with the 1832 Adamic revelation and the parallel Cowdery/Williams BoM characters documents, and on into 1835 with the parallel Egyptian Alphabet manuscripts. By contrast, for Phelps to produce a document like this on his own would have been unprecedented. By the way, that's a very nice image. Is that from the archive DVD? for Phelps to produce a document like this on his own would have been unprecedented. Actually, the image I posted above is greatly reduced and compressed in comparison to the original file. You're mostly right. But Nibley obscured their whereabouts for something like a decade before their "rediscovery", and the Alphabet and Grammar was long concealed even from the Church's own top scholars. I'm having a hard time understanding parts of this. Can you plase answer the following, since you've done so much work on this? "This is a well-known scene from the Osiris mysteries, with Anubis, the jackal-headed god, on the left ministering to the dead Osiris on the bier. The penciled restoration is incorrect. Anubis should be jackal-headed. The left arm of Osiris is in reality lying at his side under him. The apparent upper hand is part of the wing of a second bird which is hovering over the erect phallus of Osiris (now broken away). The second bird is Isis and she is magically impregnated by the dead Osiris and then later gives birth to Horus who avenges his father and takes over his inheritance. The complete bird represents Nephthys, sister to Osiris and Isis. Beneath the bier are the four canopic jars with heads representive of the four sons of Horus, human-headed Imseti, baboon-headed Hapy, jackal-headed Duamutef and falcon-headed Kebehsenuf. The hieroglyphs refer to burial, etc. ...."
2) If the papyrus is a common document, are you saying what I'm missing as the most pertinent point is that the Egyptian Alphabet and Grammar "correctly" translated it, and the translations made when the documents were evaluated by Egyptologists are incorrect? "It may be safely said that there is not one single word that is true in these explanations" (ibid p.24). "The `Book of Abraham,' it is hardly necessary to say, is a pure fabrication." "I myself studied Egyptian hieroglyphics at UCLA several years ago in the hope of resolving some of the problems connected with the `Book of Abraham' in Joseph Smith's favor. Unfortunately, as soon as I had learned the language well enough to use a dictionary I was forced to conclude that Joseph Smith's translation was mistaken, however sincere it might have been. It belongs to a kind of literature which is alien to Christianity and to our Church" (p. Joseph Smith's Papyri Found. Six small metal plates with strange engravings on them were found by local townspeople in an American Indian burial mound in Kinderhook, Illinois in 1843. An LDS elder was there when they started to excavate the mound, and when they found the plates, he suggested taking them to Joseph Smith to see if he could translate this ancient writing. Joseph briefly examined the plates and said that the engravings were similar to those on the Book of Mormon plates, and they tell a story about an ancient Jaredite who was a descendant of Ham. Joseph may have intended to do a complete translation of the plates, but was killed some time afterwards. Drawings of the six plates appeared in the LDS Church newspaper The Times and Seasons, along with how they came to be. "I insert fac-similes of the six brass plates found near Kinderhook... I have translated a portion of them, and find they contain the history of the person with whom they were found. He was a descendant of Ham, through the loins of Pharaoh, King of Egypt, and that he received his Kingdom from the ruler of heaven and earth." The logical conclusion IMO, is that the "translation" of the papyrus was wrong by Joseph Smith, and not that the Egyptian Alphabet and Grammar can somehow translate something into something else. Joseph Smith needed Abraham to introduce polygamy, which is why this conclusion makes sense, because there is motive. It's difficult to prove a negative, but until I see good evidence to the contrary, I will remain quite convinced.